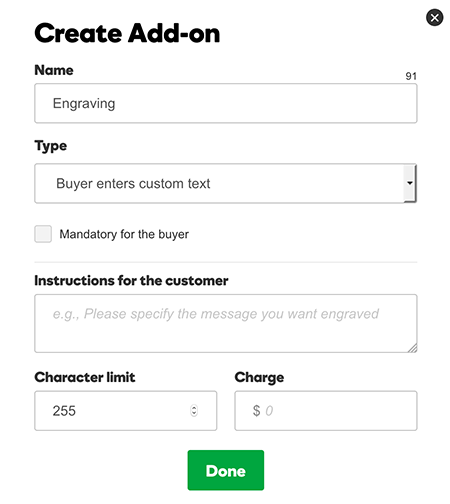 You can create an add-on to a product so customers can include a custom message for the product's recipient or add a monogram or engraving. In your products list, click Online Store, and click Manage next to account you want. Click the Products tab and choose All Products. 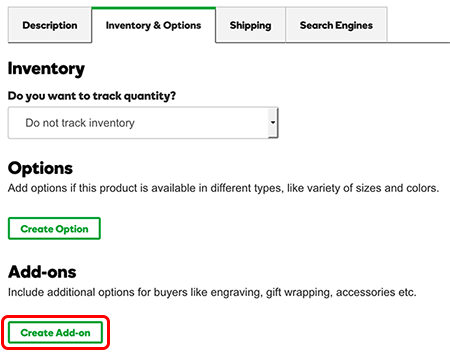 On the product page, click the Inventory & Options tab, and in the Add-ons section click Create Add-on. Type in a Name for the add-on (such as Engraving). Once you create your first few options, those choices appear automatically in the menu. In the Type list, select Buyer enters custom text. Select Mandatory for the buyer to ensure that the message isn't left blank. Add some how-to guidance in the Instructions for the customer box. For example, "Please specify the message you want engraved." Enter a number in the Character Limit text box (maximum of 255). Click Done. The message option is added to the Add-ons list. Click and drag dotted area at front of each add-on Reorders the list. Click the pencil icon Create another add-on, or edit existing add-ons. Click the X Deletes the add-on after displaying a confirmation alert.